I am pretty sure that this is more of a travel blog post than a fashion one, but I definitely gave some thought given to fashion while planning this outfit of the day (#ootd). Let me start by giving you a little background. My best friend Yana and I travel together a lot. We have funny little traditions that make our road trips even more fun and sometimes challenging – spontaneous for sure! One of our traditions is to do very little planning ahead of time. There are usually a couple of places in the area we definitely want to see, but everything else gets worked out on-the-go. We don’t even book our hotel for the night until around 6 to 7 p.m. of each day on the road. This makes the trip more flexible and full of adventure. This has resulted in a few problems. One time we were in the desert with no internet connection to book something; it was midnight when we finally found a 24-hour diner with wifi. Since technically, it was already the next day, the earliest reservation we could get was for the next night. And so we ended up driving around and stopping at different hotels to ask about a vacancy. We made up random stories to cheer ourselves up – that we were on the run like Bonnie and Clyde, for instance, and had to do this so that we could pay in cash and keep our identities hidden. Hey, you only live once! And things like that make a trip more memorable. Another of our traditions is to do what we call “every girl’s dream photo shoot.” The idea is to wear an outfit that suits a particular place – something that is an “organic” fit with the surroundings. One of my favorite photo sessions was at Vanderbilt’s mansion, Biltmore in North Carolina, at which I wore a beautiful maxi dress with flower print. This time our road trip started in Las Vegas where we celebrated Yana’s birthday. After that, we drove all the way around the Grand Canyon. 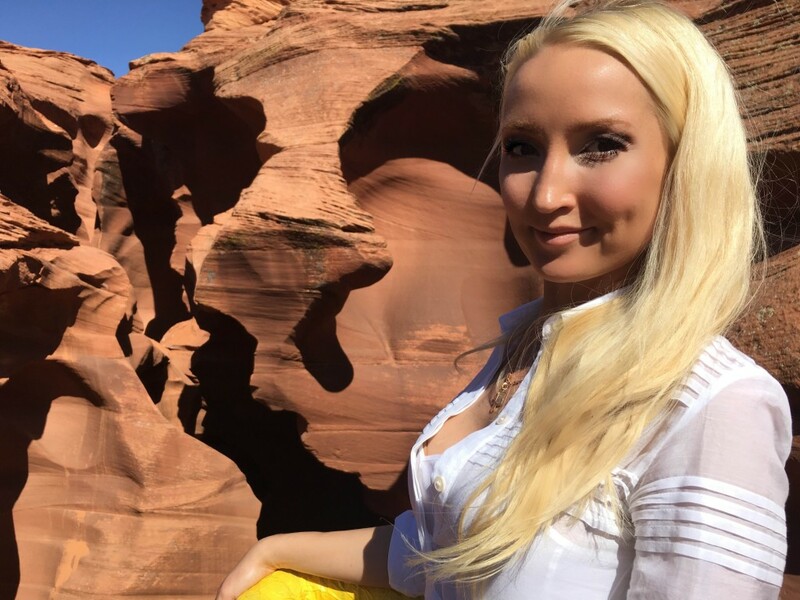 Antelope Canyon was close by and a place we definitely wanted to visit; I had heard about its unbelievable beauty. And so we went! Setting off on a cold morning from Flagstaff, I wore this Burberry Brit dress. It was perfect for the occasion! The only other perfect outfit I can imagine for Arizona would be more like a cowgirl look, but I didn’t have anything similar to that. And so here I am in my perfect white dress. First off, I had dreamt for the longest time of seeing Antelope Canyon, and in honor of that, I wanted to look nice. Because it was chilly, I was comfortable in a two-layered dress with long sleeves. It also protected me from Arizona’s harsh sun and sand that blows around in the wind. And it looked chic. There was not much hiking involved, and so these sandals worked out well. They are made of rubber that can be easily washed. And they are tough and comfortable for walking on sandy ground. Now that was the pragmatic side of the problem. 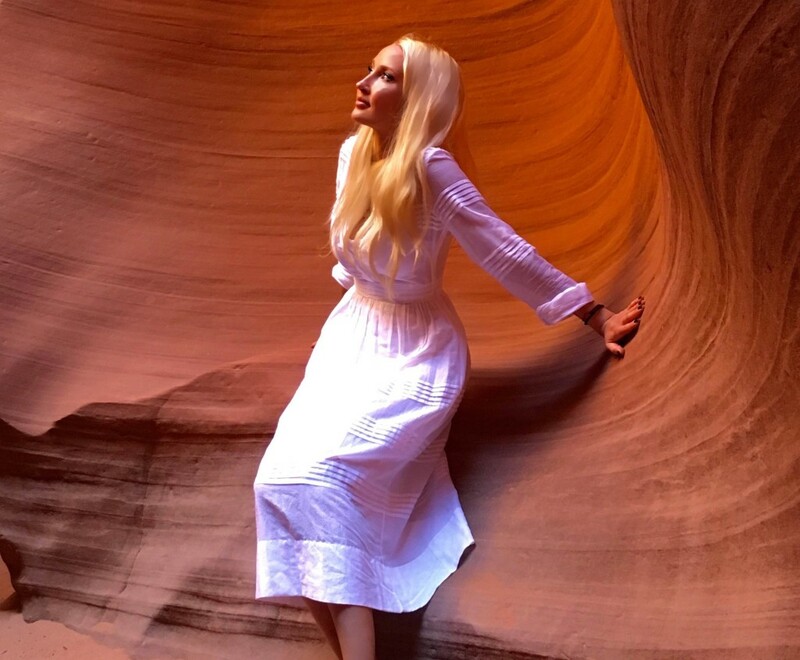 The other one was more about imagination and fulfilling the idea of making that “dream photo shoot.” For me that light, white, sort of angelic-looking dress coordinated perfectly with the rough, windy desert, rocks, and mountains. So I guess we did look pretty dressed up and didn’t exactly blend in with the rest of the tourist group. 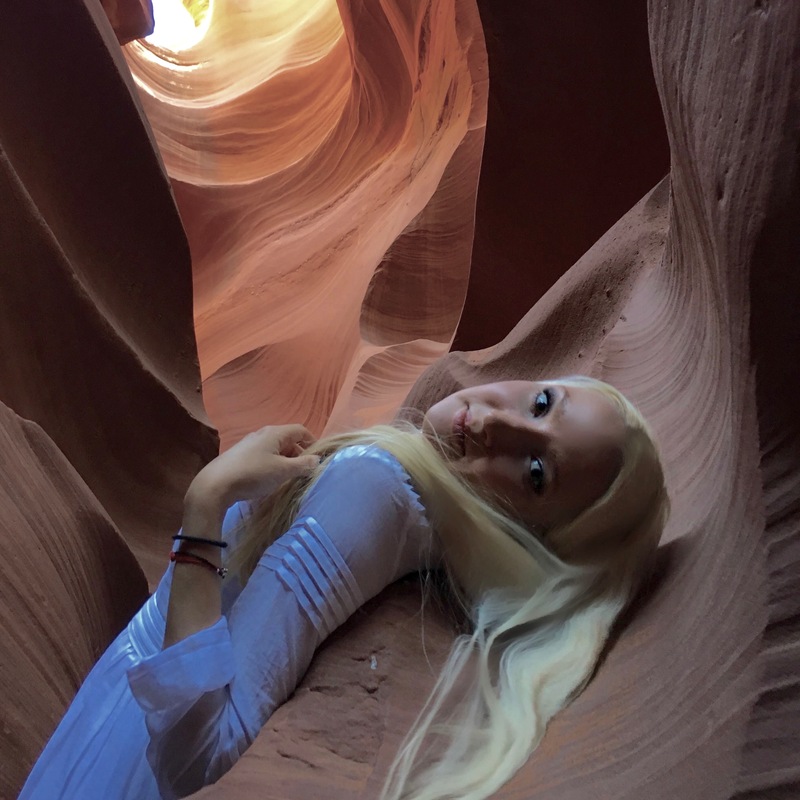 But at the end of the day, we have our perfect pictures, we made a lot of friends with people who began asking us where we were from, and last but not least, I fell head-over-heels in love with Antelope Canyon. That dress is so pretty and perfectly ethereal for the location! Thanks for sharing!